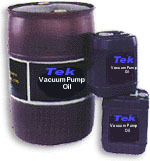 Tek-P is a hydrocarbon mechanical vacuum pump fluid. It has a higher viscosity and designed for small, medium and large belt drive vane pumps and rotary piston pumps. It has good vapor pressure and chemical / temperature stability which make it suitable for a variety of applications. 55 gallon. Weight 425 lbs.